The Jersey Tenors are a rock-opera mash up. 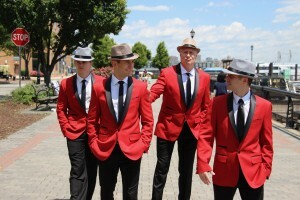 The Smith Center for the Arts is excited to present The Jersey Tenors to the Smith Stage Friday, Sept. 28 at 8 p.m. The all-male vocal quartet, led by Broadway veteran Brian Noonan, have been dubbed the “rock-opera mashup sensation” that perform everything from Figaro to Frankie Valli. While the Garden State is their current musical touchstone, it was musical theater, be it on Broadway, off Broadway, or touring nationally, that brought these performers together, says Noonan. Noonan starred on Broadway and in National Touring Companies as The Phantom in “The Phantom of the Opera,” Enjolras in “Les Miserables,” and as Cable in “South Pacific” with the legendary Robert Goulet. As an international concert soloist, Noonan has also performed for presidents and world dignitaries. Smith Executive Director Susie Monagan caught up with Noonan by phone recently to get some more insights about The Jersey Tenors. Here’s their interview. Monagan: There’s so much great music out there. How did you come up with your eclectic set list? Noonan: We throw everything but the kitchen sink at our audience, but we started as a tribute act of the Frankie Valli and The Four Seasons, or The Jersey Boys (the biographical Broadway musical and movie about Frankie Vallie and The Four Season) as it’s better known in today’s circles. The original act was called the Unexpected Boys. (We did) strictly Frankie Valli music and then once we had cut our teeth on all that great music, we decided to expand our repertoire, since most, if not all of us come from the world of Broadway. So we started adding some Broadway repertoire and then started adding more genres from the Beach Boys to opera and then before we knew it we had, as you said, a really eclectic mix. We called the act The Jersey Tenors and we wrapped it around a very loose story of our travels all around the world. We’re very blessed because we have hit all seven continents in the last 12 years of our existence, so all this music that we’ve learned in different styles and different languages we’ve incorporated into this show which is The Jersey Tenors. It has been one incredible labor of love. Monagan: Which songs are those that the audiences really connect to? Noonan: We come out of the gate with some iconic Jersey Boys music, and, of course, all those big hits, from “Big Girls Don’t Cry” and “Walk Like a Man.” Then we take a right turn and start our journey into Europe and we hit everything from Queen to Elton John to French folk music to Italian opera. Then we slowly bring it all back to what we like to call, in a slang way, The Dirty Tenors, which is everything from Bon Jovi to Frank Sinatra, Bruce Springsteen, Kool and the Gang. When I say it’s quite a mix, there’s something in it for everyone. We just did a sold-out performance last night and really blew the roof off the place. It’s really interesting to see the audiences’ reactions because they come in thinking, oh we’re going to get a Frankie Valli and the Four Seasons tribute act and then we start making a couple of right turns and by the time we hit the Italian opera, we’ve turned the place loose and they go crazy. Monagan: I guess that where the “unexpected” came from. Noonan: Yes, we kind of fell into this from dumb luck. We started putting this music together and we said wow, we really have something here. The reaction has become so much more visceral than we were used to with The Four Seasons. It’s really fun to do. One of the reasons the show has become as successful as it has is the way we avail ourselves of the material. We’re kind of like four clean-cut Jersey wiseguys coming on the scene and we incorporate a lot of guido-isms as it were, and the audience gravitates toward that scene as well. Monagan: Often you tour with recorded music to accompany you. You’re coming up to Geneva with a live four-piece band. How does that change the dynamic? Noonan: Anytime we can put live musicians along with us, it adds a whole other element to the show. We have a wonderful keyboard conductor and Broadway-based musicians who travel with us. We’re very fortunate to work with an incredible pool of Broadway musicians. It makes everything real seamless, it’s a real treat. Monagan: Living in upstate New York, we’ve always struggled to understand this: What is it about Jersey? What can a non-Jersey-ite love about the Garden State? Noonan: (New Jersey natives) cut right to it. They’re honest, they’re loving, they’re giving, they’ll tell you what they think and they don’t mean it to be mean. Some people can think it’s abrasive. I think it’s one of the most deliberate ways to treat people. It’s right out there for everyone to see. A lot of people say that about New York (City) but I would take New Jersey a step further. Everyone is extremely honest and up front with you. You’ll always know what you’re going to get when you’re dealing with somebody from Jersey. Monagan: Give me three words that describe what The Jersey Tenors are. Monagan: Okay. Now three words that would never describe The Jersey Tenors. Noonan: “Boring, not colorful?” Is that a word? I’ll have to think of a third one… I’m stumped right now. I might yield to you on that one.